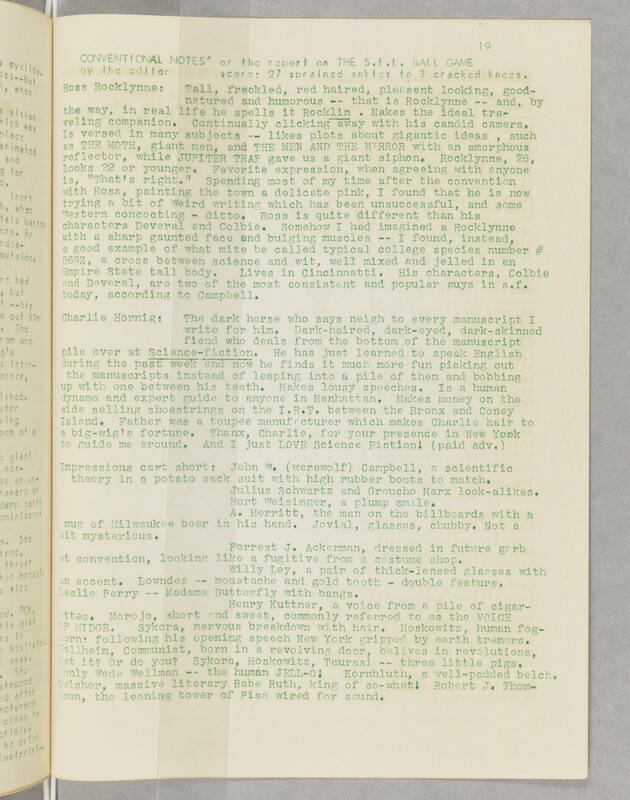 CONVENTIONAL NOTES' or the report on THE S.F.L. BALL GAME by the editor score: 27 spralned ankles to 3 cracked fences. Ross Rocklynne: Tall, freckled, red haired, pleasant looking, good-natured and humorous that is Rocklynne — and, by the way, in real life he spells it Rocklin. Makes the ideal traveling companion. Continually clicking away with his candid camera, he is versed in many subjects — likes plots about gigantic ideas , such as THE MOTH, giant men, and THE MEN AND THE MIRROR with an amorphous reflector, while JUPITER TRAP gave us a giant siphon. Rocklynne, 26, looks 12 or younger. Favorite expression, when agreeing with anyone is, "That's right," Spending most of my time after the convention with Ross, painting the town a delicate pink, I found that he is now trying a bit of Weird writing which has been unsuccessful, and some Western concocting - ditto. Ross is quite different than his characters Deveral end Colbie. Somehow I had imagined a Rocklynne with a sharp gaunted face and bulging muscles — I found, instead, a good example of what mite be called typical college species number # 56QZ, a cross between science and wit, well mixed and jelled in an Empire State tall body. Lives in Cincinnati. His characters, Colbie and Deveral, are two of the most consistent and popular guys in s.f. today, according to Campbell. Charlie Hornig: The dark horse who says neigh to every manuscript I write for him. Dark-haired, dark-eyed, dark-skinned fiend who deals from the bottom of the manuscript pile over at Sclence-fiction. He has just learned to speak English during the past week and now he finds it much more fun picking out the manuscripts instead of leaping into a pile of them and bobbing up with one between his teeth. Makes lousy speeches. Is a human dynamo and expert guide to anyone in Manhattan. Makes money on the side selling shoestrings on the I.R.T. between the Bronx and Coney Island. Father was a toupee manufacturer which makes Charlie hair to a big-wig's fortune. Thanx, Charlie, for your presence in New York to guide me around. And I just LOVE Science Fiction, (paid adv.) Impressions cawt short: John (werewolf) Campbell, a scientific theory in a potato sack suit with high rubber boots to match. Julius Schwartz and Groucho Marx look-alikes. Mort Weisinger, a plump smile. A. Merritt, the man on the billboards with a mug of Milwaukee beer in his hand. Jovial, glasses, chubby. Not a bit mysterious. Forrest J. Ackerman, dressed in future garb at convention, looking like a fugitive from a costume shop. Willy Ley, a pair of thick-lensed glasses with an accent. Lowndes — mustache and gold tooth - double feature, Leslie Perry -- Madame Butterfly with bangs. Henry Kuttner, a voice from a pile of cigarettes. Morojo, short and sweet, commonly referred to as the VOICE OF MIDGE. Sykora, nervous breakdown with hair. Moskowitz, human foghorn following his opening speech New York gripped by earth tremors. Wollheim, Communist, born in a revolving door, believes in revolutions, get it? Or do you? Sykora, Moskowitz, Taurasi -- three little pigs, Manly Wade Wellman -- the human JELL-O! Kornbluth, a well-padded belch. Swisher, massive literary Babe Ruth, king of so-what! Robert J. Thomson, the leaning tower of Pisa wired for sound.